Net Neutrality is in essence a set of rules meant to ensure that the companies providing internet connections must give everybody equal access. Under net neutrality rules, companies can’t create ‘fast lanes’ on the internet for services that pay them – although in practice there are no real ‘fast lanes’, companies use throttling to create ‘slow lanes’. Imagine that you pay for an Internet connection and then Netflix also has to pay the internet provider to get the data to you. And Amazon, Apple, and Google as well, of course. Internet companies love the idea of slow lanes, because they can charge both ends of internet connections lots of money. They can also create their own services and push them to consumers at an advantage. They can even kill competing services alltogether, without a consumer seeing it. Of course, there’s always two sides to each story. I’m a proponent of net neutrality rules, but a lot of people are against it. The basic argument against net neutrality is this: free markets are better. Consumers can have lower internet costs, if the internet provider can also make money by creating fast lanes. If companies go too far, the consumer can go to the competitor. The free market means choice for consumers, and they can choose with their wallets. This will mean faster internet at a lower price. Let’s look at those arguments a little closer. The heart of this argument is the free-market-above-all credo: the best way to do anything is to let the free market decide. No government should interfere. It’s the libertarian utopia: no rules, just contracts between parties and a free market to rule all. But what is a free market, really? The idea is that you’ve got consumers, who will buy less of a product if it becomes more expensive. On the other side are producers, who will supply more if the prices go up, because its more lucrative. Those two forces will balance each other out to reach the perfect price. Hallelujah! Of course, that’s the theory. The law of supply and demand, in practice, requires some conditions to be met. Consumers need to be well-informed and perfectly rational. 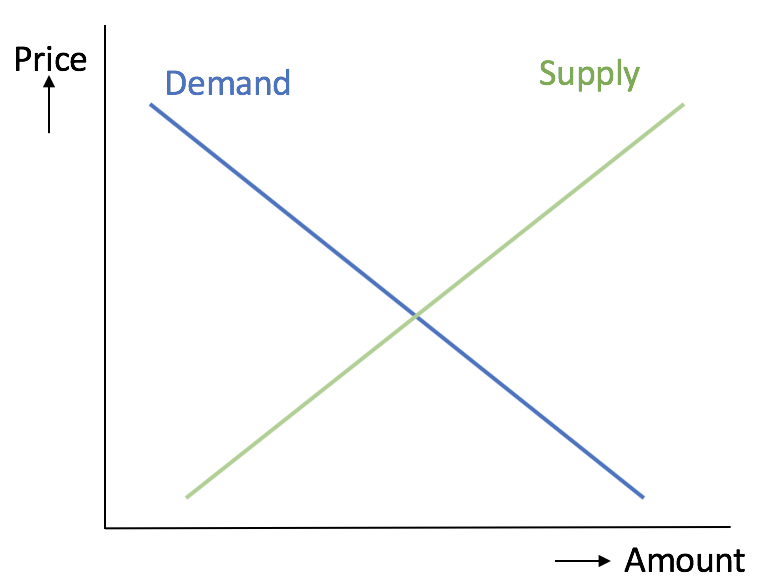 Producers need to be plenty, and the supply of product must follow the curve from the diagram above. In reality the above assumptions rarely hold. In fact, most companies try to avoid a plain supply and demand market at all cost. The law of supply and demand is really just one ideal instance of the balance between consumers and producers, where the power of both is equal. In practice, the balance of power is quite different, meaning that the law of supply and demand doesn’t hold. The balance of power can shift toward the producer for a number of reasons. Barrier of entry is one reason: competition can’t arise because the startup costs are too high – this applies to the smartphone market, for example. Intellectual property regulations is another: patents give the power to produce a thing to one producer for a limited time. Then there is the consumer not being rational and knowing way too little. Can you point out the clothes on the rack in the store that were produced by children in sweat shops? Do you even care that your smartphone was assembled by overworked people that are prevented from suicide by nets hanging in the factory? Is buying cigarettes when they kill you really a rational thing to do? Most insidious are the situations where the product is vital to the consumer. It doesn’t matter how much healthcare costs, people will buy it if their life depends on it. Hence the exorbitant prices of the free market US healthcare. The same goes for food, housing and electricity. In short, the law of supply and demand doesn’t hold at all. Libertarians especially like to pretend it does, and their utopian vision of the world breaks down alongside the law of supply and demand, as far as I can see. After the above tangent, let’s have a look at net neutrality again. Do the laws of supply and demand hold? The answer is simple: no, they don’t. Connecting people to the Internet is expensive. It requires infrastructure that you can’t put down on a sunny monday afternoon as a startup. That means there is a big barrier to entry. In a lot of places, there is only one Internet Provider, putting them in power. This distorts the supply curve. Then there is the demand side. Can you really live without the Internet these days? The US government said you can, but I don’t think the Twitter-addicted President even believes that himself. How do you find a job without an e-mail address or a way to look up an employer’s website? How do you buy things these days? Then there’s the murkiness of information. Consumers would hate it that Netflix didn’t work because their provider was throttling certain traffic, but if they didn’t know, they might easily switch to the internet provider’s own streaming service. In short: supply and demand doesn’t hold for the Internet for a second. Which is why consumers need something to give them some power as well. And that’s what net neutrality is really about and why it’s so important. In fact, regulations to balance out markets are needed for any market where producers have too much power, or where it’s a necessity for all consumers to have access to it. So that includes healthcare, food and water, housing, etc.